The NasoFree® nasal irrigator is a easy squeeze bottle system specially developed for rinsing the nasal and paranasal sinus cavities. A nasal irrigator is always used in combination with a saline solution. 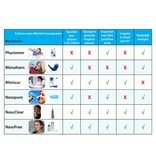 The NasoFree nasal irrigator allows you to deliver the saline solution with positive pressure to clean the nasal passages thoroughly, while maintaining your head in an upright position.You have complete control of the pressure and volume of solution, ensuring a gentle, soothing and therapeutic experience. Daily rinsing is safe and will keep your nasal passages clean, healthy and open. As said, you always rinse your nasal and paranasal sinus cavities with a saline solution. ENT specialists prefer a saline combination of natriumchloride and natriumbicarbonate. This combination is efffective and mild for the sensitive nasal mucosa. Just 'table-salt' is intended as a flavor enhancer for food, and not specifically to rinse your nose. 'Table-salt' is often experienced as sharp and contains iodine, a substance that irritates the sensitive nasal mucosa. 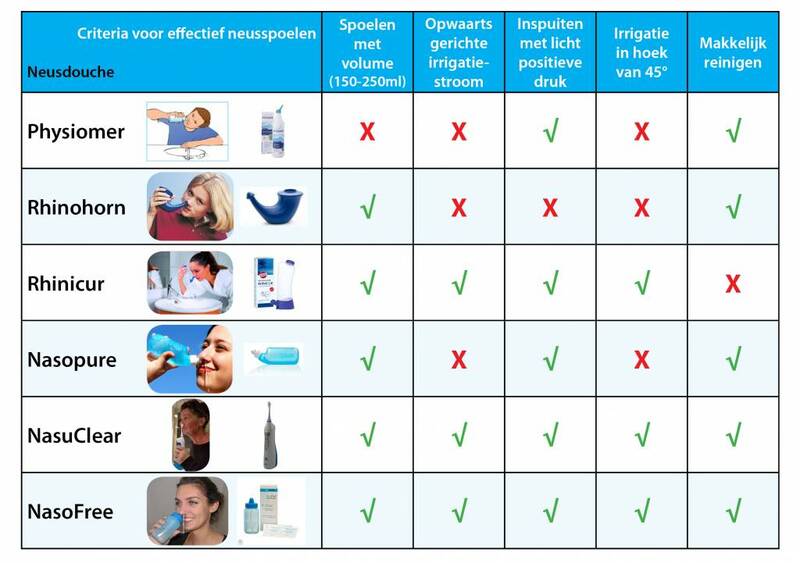 Dos Medical nasal saline is specifically developed for nasal rinsing. It contains the combination of natriumchloride and natriumbicarbonate. It cleans effectively and is convenient and mild in use. Nasal congestions from flu and cold. and nasal rinse can help reduce snoring. Scientific research has shown that there are some aspects that enhance the effectiveness of a nasal rinsing. In addition, it is of importance that a nasal irrigator can be well and easily cleaned. 1. Rinse your nose with sufficient volume (150 - 250 ml) and use a nasal irrigator which gives a slightly positive pressure at the injection of the nasal saline solution. This will lead to the most effective rinse of nasal and paranasal cavities. 2. Inject the nasal saline solution 'bottom up' at an angle of approximately 45 °. Of course, The NasoFree does not contain sharp parts. 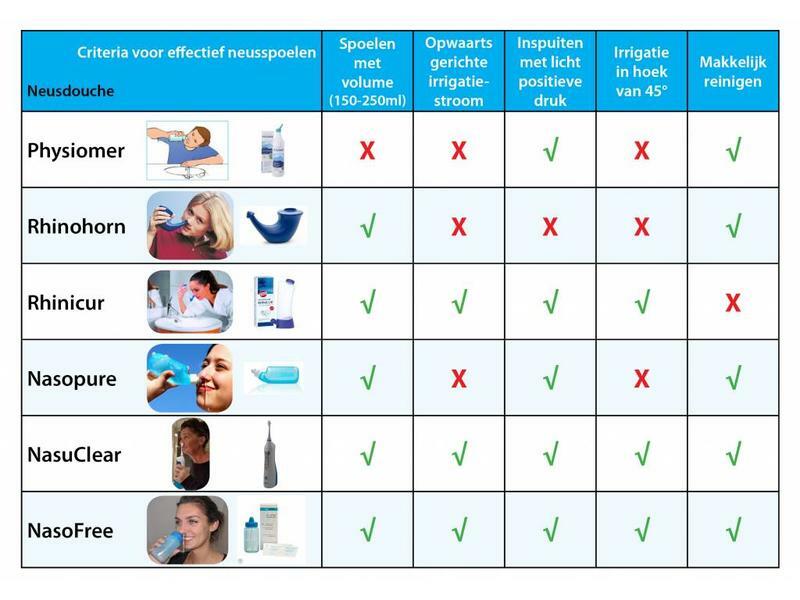 Werkt erg goed en gemakkelijk en beter dan de methode die ze mij in het ziekenhuis hebben aangeleerd.